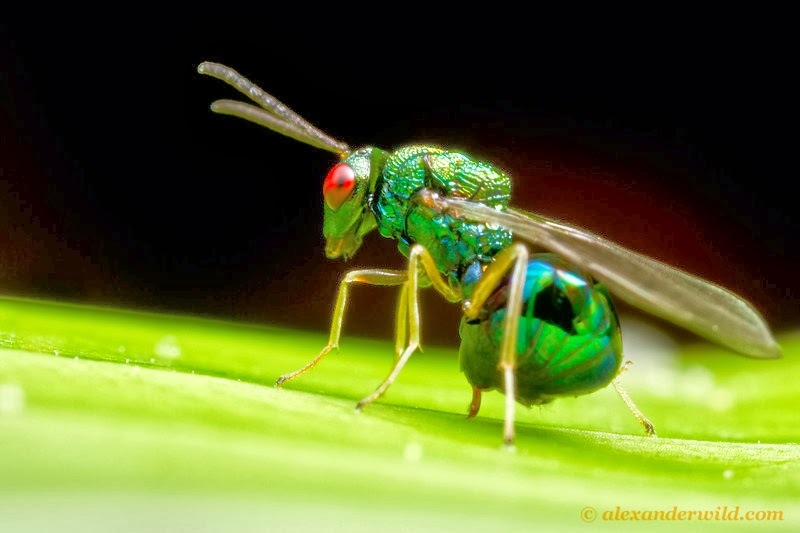 Ovipositing Orasema, photographed by Alex Wild. The Eucharitidae are a group of wasps parasitic on ants. Like the closely related Perilampidae, eggs are not laid directly on the host; instead, they are laid amongst vegetation and hatch into mobile planidium larvae that then actively seek out a suitable host. Synapomorphies (from Heraty et al. 2013): Axillae fused, forming a united transverse band such that scutellum is separated from trans-scutal articulation; transepimeral division absent; metascutellar arm less than half length of lateral panel but forming a convex flange and not reduced to a carina; propodeal spiracle circular; metapleural–propodeal supracoxal flange absent; uncus of fore wing absent; apex of protibial spur without a cleft; fore basitarsus without a comb of setae; petiole surface completely fused ventrally with no suture present; cercus flattened and button-like; ovipositor valvulae expanded.